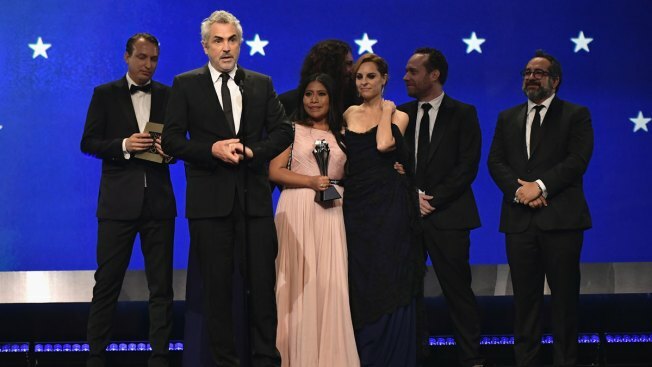 Nicolas Celis, Alfonso Cuaron, Yalitza Aparicio, Adam Gough, Marina De Tavira, Bryce Nielsen, and Eugenio Caballero accept the Best Picture award for 'Roma' onstage during the 24th annual Critics' Choice Awards at Barker Hangar on January 13, 2019 in Santa Monica, California. Films from Mexico, Poland, Lebanon, Japan and Germany are competing in the Academy Awards race for best foreign-language film. Five nominees announced Tuesday include Alfonso Cuaron's Mexican memory masterpiece, "Roma," Polish director Pawel Pawlikowski's black-and-white period drama "Cold War" and Lebanese filmmaker Nadine Labaki's child-poverty drama "Capernaum." Also in the running are "Shoplifters," the story of a family on society's margins by Japan's Hirokazu Kore-eda, and German director Florian Henckel von Donnersmarck's artist biopic "Never Look Away." The winner will be announced at the 91st Academy Awards ceremony on Feb 24.